How do you take your coffee? With cheese? Great! For over five years, adding butter to coffee has been a trendy way to incorporate some extra-rich dairy fat into one's diet. 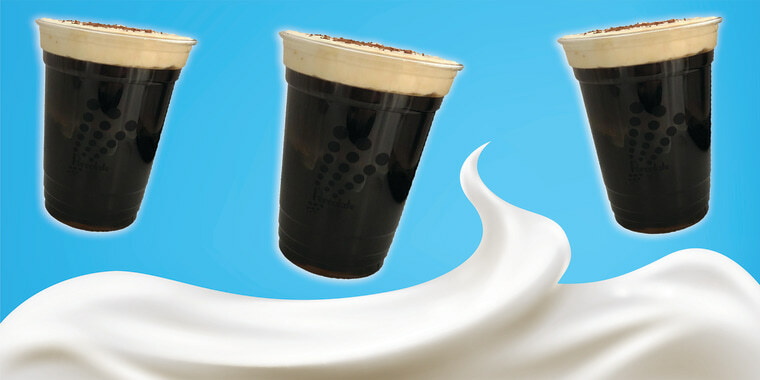 But now, there's a new creamy topping that's bound to have a few traditionalists scratching their heads: cheese coffee. Like many great food things to recently come out of Los Angeles — ice cream-filled donuts from B Sweet bakery; the celebrity favorite fast food spot In-N-Out burger and buttery Bulletproof coffee — cheese-topped coffee is a blossoming new trend. Percolate, a Los Angeles-based cafe with two locations, specializes in brewing loose-leaf teas, craft coffees and boba (aka bubble tea), all created in an Instagram-worthy fashion with dried floral toppings and vibrant, swirling colors. The owners are set to open a third location this spring. Percolate's newest concoctions are topped with a froth-like mascarpone cheese that tastes a little sweet and a little salty. The chain says its whipped-up cheese goes perfectly with a variety of its iced drinks. "Introducing The B.S.T. (bitter-sweet tiramisu). Available tomorrow at both locations," Percolate posted on Instagram in January to announce the drink. "Cold brew coffee from @unincorporatedcoffee with house made cheese & premium cocoa...."
"This sounds amazing," one follower commented on the post. The B.S.T. is made from Guatemalan beans from Unincorporated Coffee Roasters that have been cold brewed. The icy black brew is then topped with a cheese layer, which Forbes reported is "a mixture of very lightly sweetened cream cheese and heavy whipping cream." Then the drink is finished off with a little cocoa. But coffee wasn't the first beverage to get the cheesy treatment. Cheese tea has been popular in several Asian countries like Taiwan and China since 2010. Today, even Kraft has its own easy recipe for a simple cream cheese-topped tea. In 2018, Percolate released its first cheese-topped drink: a peach iced tea. "Double cold brewed oolong tea with a velvety layer of sweet yet savory house-made cheese," Percolate noted when the drink was released last fall. But the new coffee, as per its namesake, has a more bittersweet flavor. And it hits just the right balance of salty, nutty, milky goodness that will likely make Monday mornings just a little bit better. If Starbucks gets a whiff of this, expect to see cheese coffee coming to a shop near you soon.